Reggie Fils-Aime, president of Nintendo of America, is at E3 in Los Angeles this week to promote Nintendo’s latest resurgence and hype people up on the coming year of Switch and 3DS games. But he’s also ready to field questions, and we had a bunch. After grilling the man, here are some of our key findings. Reggie Fils-Aime, Nintendo: What we expect is that for the Nintendo 3DS family of devices, the appeal is a thousand different games, a wide range of different experiences, a wide range of different formats, whether it’s the New 2DS XL or whether they brought a new 3DS last year or whether they buy a New 3DS XL. We think that consumer is looking for essentially exclusively portable type of games and experiences. And they want to have content for that vast library. Fils-Aime: First, it was a dedicated focus coming out of Wii U to make sure that we had the steady cadence of games. As I look at Wii U from a business perspective, that’s the one thing we were not able to do as well as we hoped. So it was clearly a priority. Second, we have many more developers today working on our content than we did five years ago or even 10 years ago. Stephen Totilo, Kotaku: You even mean internal? Fils-Aime: Internal, right. Exactly. We’ve got that new development building in Kyoto that’s full of hardware and software developers. So we have a lot more development staff than we did at the beginning of the Wii U generation and certainly throughout the Wii generation. This third-party headset from Hori recently got us talking about how cumbersome Switch voice chat, which requires a mobile app, may be. But Reggie cautions that this is just one execution of the way it may work. Fils-Aime: We actually think that the phone is going to deliver a better, more robust execution. In terms of the APIs that we can build into an app, the fact that phones are ubiquitous, the fact that it allows us to do much more rapid improvements and updates to the service, that’s why we think a phone execution—and specifically a mobile app execution—is going to be better for the consumer. Fils-Aime: So let’s be clear. What you’ve seen is the execution by one particular supplier. That is not going to be the only solution. Totilo: But it’s going to require a phone no matter what? Fils-Aime: It’s going to require a phone. It’s going to require a mobile device and be delivered by an app. Totilo: Have you guys said if there’s going to be, aside from all that, a Virtual Console experience? Fils-Aime: We’ve not used the term Virtual Console. Totilo: Do you plan to sell your older games to people? People got used to that with Wii and Wii U as downloads. Fils-Aime: What we’ve said is that as we communicate the specifics of the Nintendo Switch online service then at that point we’ll communicate what it is we’re doing with our legacy content. Totilo: It’d be great to be able to download and play some GameCube games on my Switch, Reggie. I’m just telling you. Fils-Aime: I see a lot of consumers hoping and wishing for that online. 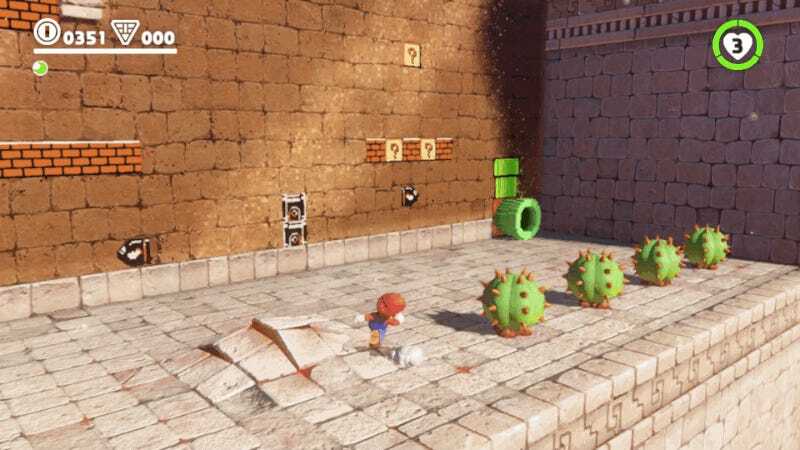 Super Mario Odyssey was Nintendo’s most impressive game at E3. Reggie told me that the Switch demographic, fueled by The Legend of Zelda: Breath of the Wild, has attracted the “young adult, active player, a consumer who played a ton of hours” and that Mario Kart 8 Deluxe has added more parents and kids. He predicts that this Mario game will widen Switch out to Nintendo’s true target: anyone from age nine to 95. On the risk Switch owners take that if they lose their system, they will lose their save files, which currently can’t be backed up. Totilo: We at Kotaku have heard the feedback—and I’ve even worried about it myself–that the lack of cloud save and even the back-up option I can do with my 3DS [can cost people their save files if they lose their Switch]… do you guys hear that message? Totilo: Can you say that there’s a solution coming? Fils-Aime: I can’t say there’s a solution coming, but we do hear the message. Fils-Aime: I did not. I finished the game. So, I was at about 100 shrines and about 150 korok seeds. I was there in Hyrule Castle, up in the high [spires] collecting my Korok seeds and I flew down right into the sanctum and immediately thrust into the final battle. I wasn’t wearing the outfit I wanted initially, I had to fight. I had to beat Calamity Ganon. And I did. Fils-Aime told me he’d go back and get more Korok seeds soon. And we’ll go back to Reggie in the future and see if Nintendo can deliver on some of the things he wasn’t able to answer about yet. Everyone’s going to collect! 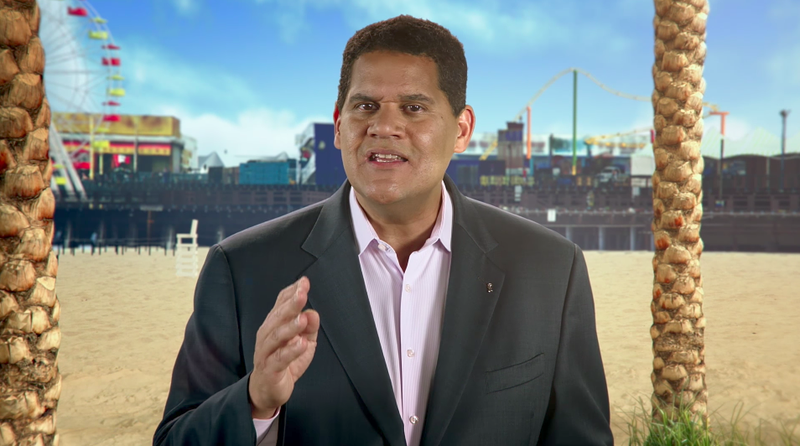 We’ll have more about Nintendo’s big E3 showing and a little more from Reggie in the coming days.